It's not long since Slotastic just did a big update on its mobile casino to make room for all the new mobile slots they've been adding. And just a couple of weeks ago RTG's new Secret Symbol slot made its debut in the mobile casino. Now they've added three more mobile slots from Realtime Gaming! 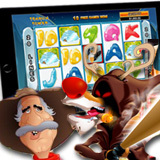 They've been popular in the online casino for desktop and laptop computers for some time and now Penguin Power, Hillbillies and Return of the Rudolph are available in the mobile casino for smartphones and tablets. Until the end of the month, if you've made at least one deposit in March, you can also get 50 free spins on the new Secret Symbol mobile slot game. Penguin Power, Hillbillies and Return of the Rudolph now available for smartphones and tablets.